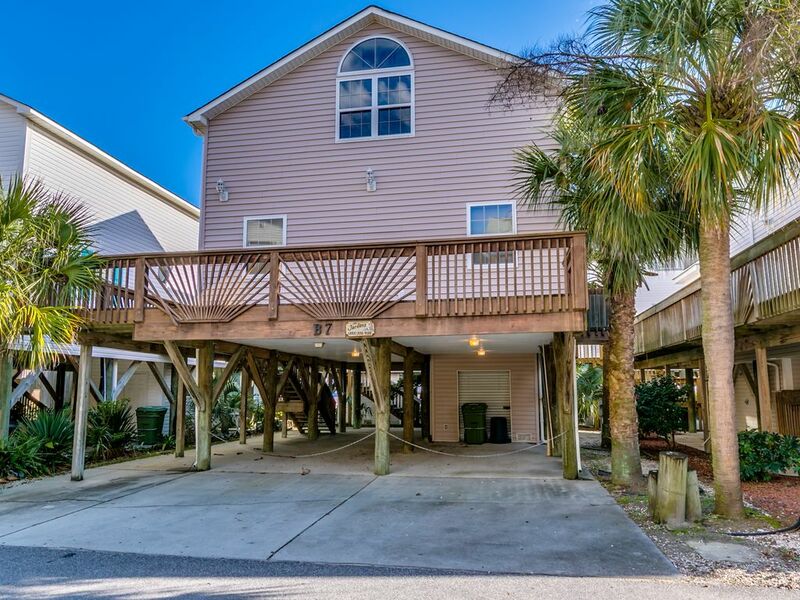 Enjoy your family fun vacation in our Non-Smoking, three bedroom, beach house with the comforts of home, located just 80 feet from the ocean with great views. Ocean Lakes Family Campground is gated with 24-hour security. There are outdoor Olympic size pool, three kiddie pools and four seasons center featuring a heated indoor pool located within a 5 minute walk. At the Sandy Harbor Family Fun Center check out the discount tickets for movies, theaters, golf courses and restaurants. Excitement in the air about new Adventure River featuring "The Rapids" and a lounge ledge, Drop Zone Mat Racer, The Tube slide, and kids water play area with a brand new Splash Zone and Tab Pool open Memorial week of 2016 . Ocean Lakes offers family activities for the young and old to entertain at your own pace. The beaches are patrolled and there are lifeguards on duty during spring and summer season. Come visit Ocean Lakes make memories that last a lifetime! Upstairs 1 Queen bedroom w/bath facing the beach.Oceanview. .
1 Queen bedroom, walk-in closet w/bath next to the room. Laundry room is conveniently located on the first floor. Express check-in forms provided for car passes are $10.00 per night for each vehicle to Ocean Lakes.There are parking under the house for 4 vehicles. I do not rent my golf cart with the house because of liability. You will love the location, only a few minutes away from the beach, playgrounds, basketball courts, pools and the recreation center. Cancellation Policy: With family emergency or death in the family I will refund your money. Work with you at a reasonable request. Person or persons that is either evicted and or arrested while on the property for misconduct and bad behavior NO MONEY will be refund. Prime location and easy access to the beach. Great summer beach home with fantastic amenities. The house is very well laid out for multiple families to stay and have enough space to relax. From the moment we checked into the house, to moment we sadly closed the door on our family vacation, Joyce’s house was the perfect place for our family. The beach is literally a 3 minute walk away so it was perfect for our 16 month old and her nap schedules. We were able to see and hear the ocean from the back deck which added so much to our stay. The house was clean, kitchen fully stocked with all essentials plus more, bedrooms very comfortable, bathrooms reflected the beach style and the location could not be more perfect!! Joyce was very easy to communicate with and extremely accommodating. She let us leave items at the house after check out so we could drive some family members to the airport and come back to load up the car later. The Ocean Lakes property itself had so much to offer and we really only left for grocery store runs. The pools, water slides, lazy river, gigantic kiddie splash pad, family fun center, mini gulf, nature center, numerous lakes and friendly staff members were so impressive!! We cannot say enough about this campground and property. Our family will absolutely be booking with Joyce again! Always makes me happy knowing the families enjoyed staying at our beach house for their vacation. Hope your stay at Ocean Lakes that your family made memories that will never be forgotten. We just got home from a week long stay at this property. We had a group of 7; 4 adults, 3 children. The house was the perfect size, everyone had their own space. The house was very clean and well stocked. It’s located in the perfect spot. We were able to walk to everything including the beach, pool, arcade, rec center, and store. We would absolutely stay here again. Thank you for the positive review. You and your family always be welcome here. This house was very nice & clean. Linens being furnished was a plus & they were good. Enjoyed drinking my coffee on the deck each morning where I was able to see the ocean. This house did not have a gas grill, which we knew going in, but that was my only complaint with this house. We have stayed at other houses in Ocean Lakes but this is the best one so far. The owner was very nice to work with. Would rent it again. We had five people in the house for this vacation. The ages ranged from 59 to 8. We had plenty of room for everyone. I, being the 59 yr old, chose the bedroom downstairs. That bedroom is in the back of the house with a bedroom/hall bathroom. I loved it. It gave me a sanctuary. And it was easy access to the rest of the family on the main floor. My son, daughter in law and two grandchildren, one 16 and one 8 also had plenty of room upstairs with 2 bedrooms, 2 baths and a middle area with a TV and sofa bed. The location awesome! An easy walk to the pools, arcade, beach, etc. And it has an amazing view for a 2nd row house!!! The owner was very nice and very easy to work with. We would highly recommend this home to anyone. Family Time together at the Beach !!! We enjoyed our stay at this beach house first time we have stay at a beach house and at Ocean Lakes. The owner is so nice . We had a wonderful time and enjoyed our family so much being together here at Ocean Lakes. Making memories with our family that will never be forgotten. We have rented this house many times over the last 20 years--we keep coming back! The house is always immaculate, the location is great. The owner is wonderful and is a phone call away if we need her. We have so many great memories & love staying in this beach house! Ocean Lakes is a wonderful place for families with children. We have 3 grandchildren ranging in age from 19 to 8. There is always something for them to do & we feel comfortable with the security provided by Ocean Lakes.